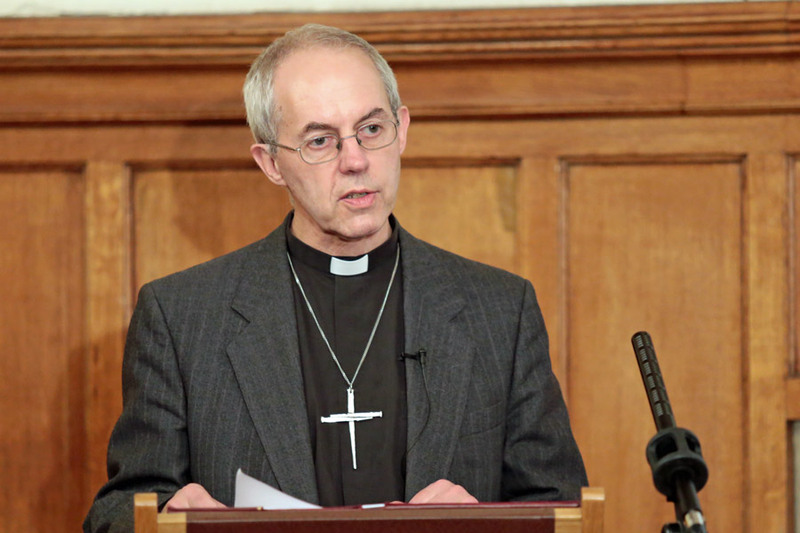 The Archbishop of Canterbury speaking at Lambeth Palace on March 5. Last week, Justin Welby, the Archbishop of Canterbury, the spiritual head of the Church of England and the Anglican Communion, gave the best speech or sermon I’ve ever read about what he calls the “E-word,” evangelism. He recognizes that his church isn’t doing it well. He says it’s the responsibility of every Christian, not just the “professionals,” and—yes—it requires words. I want to start by saying just two simple sentences about the church. First, the church exists to worship God in Jesus Christ. Our motive driving this priority for the Church is not, not, not – never, never, never – that numbers are looking fairly low and the future is looking fairly bleak. Never. This is not a survival strategy. This is not to say I am in any way nonchalant about the seismic challenge facing the church. But evangelism is not a growth strategy. This entry was posted on	March 14, 2015 at 10:11 am	and is filed under Uncategorized. I agree. Makes one wonder why we (the church) spend so much time and money on the “decoration”. I have some possible answers. What do you think? I think if we really believe, as Welby says, that following Jesus is the most important decision we can make—one with eternal consequences—how can evangelism not be our top priority? I think that a soft universalism has crept into our theology that says it doesn’t matter what we believe, God will love us and save us anyway. So where’s the urgency for evangelism? Again, do we really believe what we preach or don’t we? Wouldn’t it be great to hear such a sermon from a UMC bishop? And Welby is not known as being super conservative or anything. He just knows the gospel. That’s probably my greatest struggle about remaining in the UMC. There is hardly any talk about the gospel. Almost nothing is seen in a theological light. All I ever hear about is doing good stuff. Which is good but if it is accompanied by the gospel, just how good is it? Are we just another benevolence agency? If we never proclaim the gospel with authority and power (evangelism), then how are we truly being the body of Christ? In my time in the UMC, evangelism has been poorly defined (not biblically, not theologically) and is often seen as a dirty word. In the south, it’s seen as something those dirty SBC’ers or crazy Pentecostals do. I’m trying to do my part, at least. I’m going to preach about this tomorrow. There’s a lot of emphasis on “church growth” in the UMC, but mostly it’s about “sheep-stealing,” if you know what I mean. We’re mostly “reaching” Christians—either by stealing them from another church in town, confirming the children of Christians, or appealing to Christians who are new to the area. The idea that Methodists would be so convicted for the lost that they would share their faith and invite people into a saving relationship with Christ… We have a long way to go. But this problem didn’t happen overnight, and it can’t be solved overnight. I’m hanging in an seeking to be a part of the solution like you. And I try not to be too critical of the culture I see among clergy. I know that the clergy culture is the same in many denominations. I also know that the solution to this is hearts “strangely warmed.” It’s only when the love of God is poured out in hearts that we truly have His heart for the lost. In my band meeting last week, I told them that that’s the reason why I don’t throw in with the left or the right but with the Spirit-filled/charismatic renewal minded people. Changes in positions or any sort of human machinations will not make us mission-minded, Gospel-centered people. Only a fresh understanding of the gospel inspired by the Spirit accompanied with a fresh vision of the gospel will get us on the right track. Man Brent, you really can nail it with a phrase. “Soft universalism” and “Sheep stealing”. Those things are so true. Add too it, Gospel Relativism, and I think we have it covered. Soft universalism we have covered before. Silly questions like, “will we see Hindus in heaven?” We are so worried about helping God to “be fair” that we forget that he is sovereign. He will have mercy on who He will have mercy. Trust the Word. Sheep stealing can also be a cult of preacher centered “entertainment”. Do folks enjoy our “club”? Are our social programs fun and entertaining. The end justifies the means, as long as we get them in the pew for an hour (and don’t forget the demands of the budget). I understand that it’s “tricky”, but some preachers manage to attract a flock, while still going deep with the word. It’s just harder. My pet peeve is the “comedian in the pulpit”. Relativism? I could go on for hours. It’s not just the Church, but all moral authority. We have to stand on the “Gospel Truth”. All other ground is “sinking sand”! Josh, you nailed it too. I find it tempting to move to another denomination, say reformed Presbyterian or Baptist, but I am almost 70, and I have so many true friends in our church that I think it better for me to keep nudging away against the tides mentioned above. God brought me to this place in life for a purpose. I’ve been on the other side of the fence and it’s no better. Where there are human beings there are problems. Although Wesley was slandered, mocked, and banned from certain pulpits and parishes, he refused to leave the Anglican church. The doctrine was good – based on the scriptures and rooted in the ancient creeds. The main problem was that leaders in the church were aloof and did not show much care about the salvation of people. I was a history minor in college and have taken enough undergrad and graduate Christian history classes to choke a mule. And one thing that sticks out to me is that the truly world-changing movements came from the bottom, the grass-roots. John the Baptist, Jesus, the desert fathers, the missionary monks, the Reformers, the Wesleys, Pentecostals, charismatics – all of them were the folks on the bottom who responded with faith to the Holy Scriptures and followed the leading of the Holy Spirit. Folks at the top rarely did anything good. There were a few kings in Israel’s history that did some good things but still didn’t powerfully impact their environment. And in Christian history, there were people like Pope Leo who helped the church focus on Christ as Rome crashed around them (but Rome still crashed). I have decided that I am not going to pay attention to what our so-called “leaders” are doing. It bums me out more often than it helps. I’m going to focus on doing what those “folks on the bottom” did and trust God do make my life count. Denominations, just like earthly kingdoms, will rise and fall but the kingdom of God will keep going strong and soon envelop all of creation. Thanks for this insight, Josh. Brent, are you familiar with Peter Kreeft of Boston College? He is a professor of philosophy, but his works on Christian Apologetics are good. Oh sure! He’s often mentioned alongside Alvin Plantinga as the best apologists of his generation. I’ve heard Christians say things like, “I witness with my life not my lips”. That’s ridiculous. In what other area of our lives besides witnessing would we not consider our lips, what we say, part of our lives and our living? Everyone who calls themselves a Christian, or even goes to church, is being a witness for Jesus Christ. The question is what kind of witness one is being. I don’t see how anyone can be much of a witness without using words. Timely words, with lots of listening, to be sure. But words must be used. How can we show people how to be a disciple of Jesus Christ and how can we teach them to observe all He has commanded without using both words and actions? Part of the problem is that we want to identify with Jesus Christ and receive His grace and benefits, but we are ashamed of His truth, His call to submit to His Lordship, to obey all He commands and not just what suits us. We are too concerned about political correctness and inclusion, because we are afraid of persecution or even a bit of opposition or discomfort. So we try to content ourselves with decorations and try to believe that is enough. We spend so much time and effort on social activism and programs. But many other groups including the government are already doing these things, but we don’t even do them as well, and we know it. That’s whey we write endless resolutions and letters appealing to the government to do this or that to feed the hungry or stand up for a woman’s right to abortion on demand, for examples. What we can do that no one else can do is make disciples of Jesus Christ, yet we are doing everything else. Giving people clothing or shelter, that’s politically correct. Standing up for the rights of homosexuals to change the meaning of marriage (as if they could) is politically correct. But telling people that Jesus Christ is the only Way, Truth and Life, that He must be Lord before He can be our Savior, that we must repent and believe in the Gospel, that we must not just believe in but believe into Jesus Christ, that’s not being inclusive, it’s not being loving, and it’s just not politically correct. Well, forget political correctness. Leave that to the politicians. If we aren’t worshiping God in spirit and in truth and being His holy witnesses and disciple-makers, we aren’t being The Church. How I hate that word “inclusive”! Am I wrong to think that if we focus on people getting saved, we’ll get the good works (NOT including lobbying for abortion on demand!) and social holiness thrown in for free? Thanks, Victor. Brent, “inclusiveness” is one of my pet peeves, right up there with “diversity” and perhaps my “most hated”, “political correctness”. Do these purveyors of political correctness, diversity and inclusiveness (they all seem to go together,like the multiple symptoms of a serious illness) know the Gospel of Jesus Christ at all? (Unfortunately, that sounds like a rhetorical question). How much more inclusive and diverse can you get than “for God so loves the world”, “whoever calls on the Name of The Lord will be saved”, and “go and make disciples of all nations (peoples)”? [i]Christian[/i] inclusiveness and diversity are good things, but that’s not what most people, including United Methodists, are talking about when they talk about inclusiveness and diversity, or unity for that matter. As to political correctness, it has no redeeming value or Christian context at all in my opinion, and I just plain hate it. Political correctness does great damage to our Christian witness and work, and to the entire church of God. Brent, the answer to your question is yes. If we focus on getting people saved, on being holy witnesses of Jesus Christ, then good works and social holiness will be a part of that. Witness and good works or social holiness are not two or three separate things, it’s all a part of being holy witnesses of Jesus Christ. We compartmentalize things too much. Life, and lips. Witness, and works. Personal holiness, and social holiness. Again, we complicate things too much, and I think we do that because it makes it simpler for us to do what we want and serve our agendas, instead of doing the will of God and His mission. Given the situation of the AC, these remarks are reminiscent of those once made by another AC priest… by the name of John. In short, just what the AC needs, a breath of fresh air! Bravo!